Originally I didn’t plan to visit any of the national parks on this trip, but it’s been so difficult for us to get down to Bryce Canyon that a few days before we left I decided we should go on Thanksgiving Day. We did one hike in the park a year ago (Mossy Cave), but still hadn’t visited the main amphitheater. I wanted to leave Kanab by 7:15am. We were driving an hour and a half each way and afternoon snow showers were in the forecast. In order to maximize our time at the park, I picked out a combination hike – the Figure 8 Loop. Using three popular trails, the route forms a figure 8 and would allow us to cover the most ground in the least time. It was going to be roughly 6.6 miles in all, so I wanted to get an early enough start to be mostly finished when/if the snow began. We arrived around 8:45am at the Sunset Point parking area and had no trouble finding a spot. (It was a different story when we left!) It had been overcast for most of our drive, but as we arrived in Bryce Canyon the clouds began to part and the sun came out. We put on our layers and packs and got started. 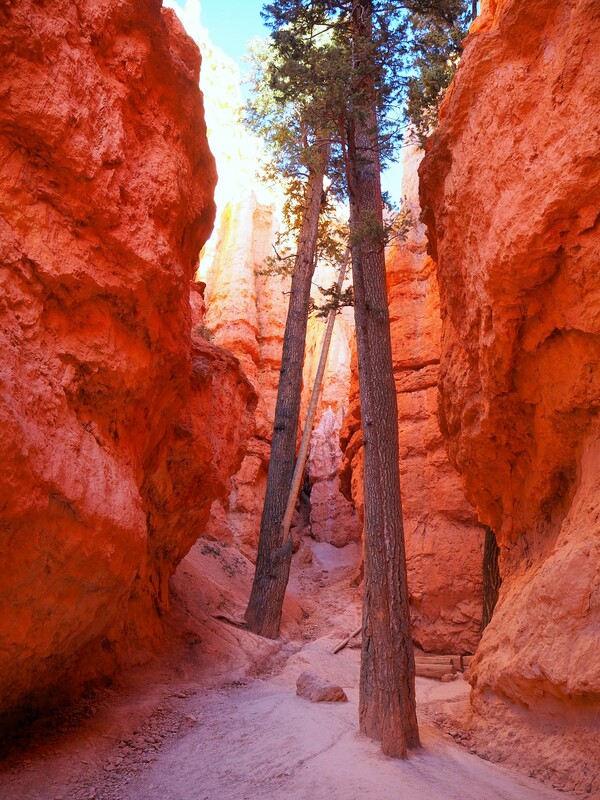 We began the loop at Sunset Point, descending into the hoodoos via the Wall Street section of the Navajo Loop Trail. It was cold out, so the sun was a welcome addition to our morning. The Wall Street section is a series of switchbacks rather reminiscent of Walter’s Wiggles over in Zion NP. I was happy to be going down instead of up! At the bottom we traversed through a thin canyon, found ourselves at the top of a long staircase, and ended up between a couple of towering Ponderosa pines. The trail led us away from the hoodoos and into an environment I hadn’t imagined when gazing from Sunset Point. Soon we were leaving the Navajo Loop for the short connector to Peekaboo Loop. We had warmed up by this point, and as we began the loop we needed to shed our winter layers. The first part of the trail led us up in elevation and provided great views of the clusters of hoodoos just below the rim. We had the trail almost entirely to ourselves for the majority of the first half of the loop. Shortly into the loop clouds began moving across the amphitheater. We thought it signaled snow, but aside from some errant snow flurries, it remained clear. The highlight of this loop is the Wall of Windows. Since we did the loop counter clockwise, the wall was behind us on the trail. I knew to keep an eye out though, and once we reached it, we continually turned back to gawk at it. It really was stunning, and one of my favorite parts of the hike. The entire Peekaboo Loop was beautiful and well worth the detour. You can get just slightly off the beaten path of most tourists and claim a little bit of communion with the scenery. We weaved around hoodoos and under carved doorways, past large Ponderosa pines and up and down numerous switchbacks. It was my favorite portion of the Figure 8 Loop. We wrapped up the rest of Peekaboo Loop and doubled back to the junction with Navajo Loop/Queens Garden. The final part of the Figure 8 was Queens Garden Trail. We followed a gentle trail for a while and then slowly began to gain some elevation. We made the slight detour to the Queens Garden to see the Queen Victoria hoodoo. (I definitely see her!) And from there it was an ever-increasing climb back to the rim. The end of Queens Garden was a real slog. It was a surprisingly steep hike up to Sunrise Point. We admired the view from the point and then finished our loop with a short half mile trek back to Sunset Point. There were many more people than when we arrived, and our parking spot was a hot commodity. We decided to drive to the end of the park and stop at some of the other viewpoints before leaving for Kanab. We went first to Rainbow Point. The weather changed drastically as we drove higher and higher. The wind was bitingly cold and snow began to fall erratically. I was less enthusiastic about getting out at some of the overlooks, and they ended up becoming quick roadside photo dashes. I wanted to stop at one more of the amphitheater overlooks, so we drove to Bryce Point which we’d hiked underneath on the Peekaboo Loop. It was still fiercely cold and windy, but the clouds had blown out and sunlight illuminated the amphitheater. It was a gorgeous ending to our day at Bryce Canyon. Breath taking. Son’s name has special meaning now more than ever. You guys are the best!!!!!! Amazing scenery! What an adventure!